LG U+ is committed to reducing energy and greenhouse gas emission from business activities and to creating new environmental values based on the environmental vision of LG Group, ‘Green 2020’. LG Group’s vision, ‘Green 2020’ aims to go beyond the previous green management principle of protecting and preserving nature. 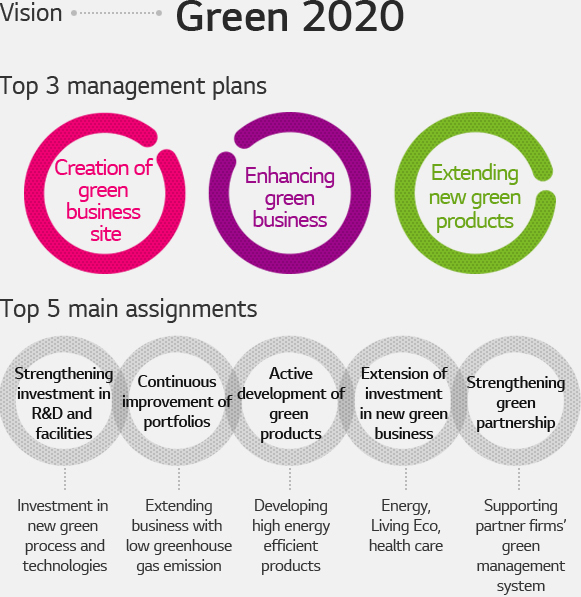 The vision consists of top 3 management plans, ‘creation of green business site,’ ‘enhancing green businesses’ and ‘extending new green products.’ LG U+ shall strive to actively participate in ‘Green 2020’ by minimizing our management activities’ environmental impact and discovering new growth engines through ICT technology development. LG U+ is operating a systematic energy management council to continuously pursue green management. Management council which is composed of environment specialist of different divisions monitors and collects related data to achieve mid-and-long-term energy management goals. Moreover, as most of the greenhouse gas emission comes from network facilities due to the characteristics of telecommunication business, we prosecute energy reduction plans in stages by operating a corporate-level reduction council. LG U+ has been participating in Carbon Disclosure Project since 2013 and is transparently disclosing our activities and results of reducing greenhouse gas emissions. Having awarded the CDP carbon management special prize and CDP sector winners award in 2014 in recognition of improvement in CDP scores, LG U+ won the CDP sector winners award that is given to the companies that have remarkably coped with climate change for the two consecutive years. Furthermore, LG U+ was registered in the CDP A-list as one of the top 114 companies among 5,500 global CDP participants for its activities to cope with climate change and was recognized as a global leader of carbon management.